This Yamaha outboard year model chart will only work for Asia Pacific distributed engines. 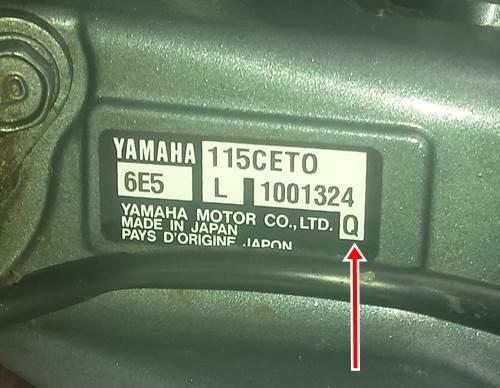 If you have a Yamaha engine that has been bought in from America or Europe direct the parts will still be the same but your model and year model code will be different. You will have to use your own knowledge of your engine to select the appropriate year. For Asia Pacific engines your year model code is found on the bottom right hand corner of your serial number decal. It will be a single letter as per the diagram below which can then be matched to the chart. Note: The letters will repeat in the below chart so use your judgement as to the correct year, ie: the engine in the picture is a 2003 model and not a 1982 model.